Babies can be fickle nappers, but they all need them – about three hours' worth until they are nine months' old. A baby who won't nap can be of endless frustration to a tired mama. Ideally, your baby would nap peacefully and without issue in his crib. But we all know sometimes babies have different ideas, and that moms have to do what works. Here are ten techniques to try if your little one is not napping. To establish best sleeping practices long term, do try to put your baby down in his crib at bedtime, no matter what happens at naptime. Don't wait until your baby is beyond exhausted to put him or her down for a nap, or you'll risk him getting a second wind – or releasing the stress hormone cortisol, which will also keep him awake. Make sure you're watching for the signs that he's getting sleepy – rubbing eyes, fussing, yawning – and begin put him down as soon as you see them. You have about a 30-minute window from when he starts getting tired until he resets, so don't miss it! What a mom eats affects her breast milk. If you're a nursing mama having trouble getting your little one to nap, make sure you're not consuming too much caffeine, some of which makes its way to your milk. Coffee, black and green tea, chocolate, sodas, headache medicines, and energy drinks are all sources of caffeine. Experts recommend limiting intake to 200 milligrams a day or less; consider eliminating it altogether if your little one is resisting naps. Few tired babies can resist the movement of a stroller. Strap your little one in and head outside for a walk. Or go to the mall for an indoor stroll. Once baby is in a deep sleep, return home or pull over and stop moving for the best possible sleep. Lay the groundwork for daily naptime by establishing a familiar routine that will send a signal to your little one that it is time to sleep. Make it similar to what you do at bedtime, only shorter. Your nap routine might include going into a darkened room, a diaper change, soothing music, reading a book, a massage, and a feeding. Whatever you choose, make sure you're not including anything stimulating like TV or loud toys. 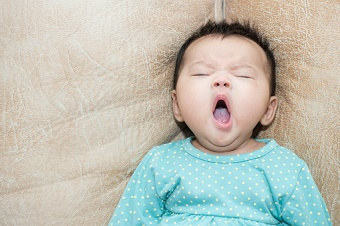 Tiny newborns can be extremely temperamental and unpredictable in their nap patterns. For those first few months of their lives, a mom might want to try snuggling their sleepless little one into a baby carrier like an Ergo (with the infant insert) or Moby wrap, and then going to a stroll around the house or neighborhood. Wearing your baby during naptime means you can't easily put him down, but at least you can still get things done (or settle down in a comfy chair for a nap yourself). If you've been gifted a hand-me-down sling or carrier, be sure it meets the new safety standards to prevent accidental suffocation and falls. Some babies need white noise to help them nap (it reminds them of the rumbling sounds they heard while in-utero). If you don't have a white noise machine, you could buy an app for your phone, or even run the vacuum. For certain babies, this will do the trick and send them off to dreamland. Again, this technique involves motion, which isn't going to provide the best sleep for your baby. But for some little ones, driving in the car is a magical sleep aid that can knock them out quickly when nothing else does. Try to drive only until she's into a deep sleep, then return home. It's up to you whether you try to bring baby into the house, as you risk waking her up. Instead, you might want to sit in your car and read until she wakes up. If your fussy baby won't settle down for you, he might for someone else. Try handing him off to your partner or other family member, who could turn out to be a secret baby whisperer (this time anyway). Babies who only take catnaps are often a frustration to their parents, who would like them to sleep longer. If your little one wakes up from a nap that is less than 45 minutes, wait a minute before you rush into his room and you might find he'll go back to sleep on his own. Or tiptoe in quietly to rub his back and soothe him for a few moments before sneaking out again. It might take a couple of rounds of this before he settles down again (or lets you know that naptime is unfortunately officially over).